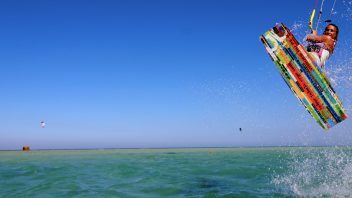 Please be aware, only certified independent kitesurfer, IKO Level 3J, can ride at Kite People. If you are not at this level, tuition is required from our instructors. “Great setup. Very friendly staff!” We stayed in the Mövenpick hotel right next door. While my wife was relaxing in the shade of the sun beds the boys went out kiting and my daughter learned to kite at this great spot. Shallow water, no waves (good to learn) and super friendly staff helping to launch and land your kite. (The area is small so this help is required and they do it skillfully) Highly recommended!! O, and I could rent a locker for all our gear. Super relaxed! 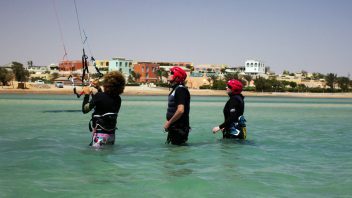 “A great school to learn and practice” We have just got back from a week in EL Gouna and received some first class tuition from the team at Kitepeople. Their setup in front of the Movenpick Hotel is ideal as this is where we stayed and could be on the beach in 2 minutes from our room. We had some group lessons and one-on-one private tuition, both of which were excellent from a variety of qualified instructors that spoke multiple languages, although English was fine with us! Would recommend these guys and this location, whatever your ability. “Kitepeople” What a first class set up and spot. We were team of four with varying abilities and it catered for them all. Fantastic instructors, staff and equipment. I could not recommend this place more highly. 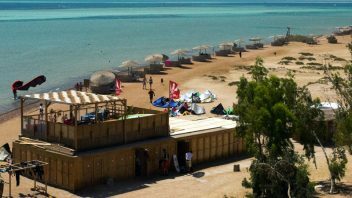 Less busy than other parts of El Gouna too. I even left my crash helmet there and they offered to get it back to me (UK). Thank you Kitepople for everything and for looking after us so well!